"Let me tell you, sir, I'm in full possession of my faculties. After all, if I were suffering from amnesia I'd be the first to know it, wouldn't I?" 'Mawdryn Undead' is the first in a trilogy of stories featuring the Black Guardian, the villain from the Key to Time saga. You know, the one who showed up right at the end, did nothing and then vanished. Yeah, that one. Like the previous trilogies produced under John Nathan-Turner's stewardship, this one is in essence just a collection of individual tales with only a single, tenuous plot thread linking them together. Remove that thread and this is simply a trio of stories that just happen to run one after the other. The main plot of 'Mawdryn Undead' sees a bunch of aliens trying to prolong their lives with a knock-off version of regeneration. One of them manages to convince Nyssa and Tegan that he's the Doctor after a regeneration gone wrong, leading to a farcical run around a spaceship that looks like a garish hotel, as the TARDIS crew and various guest stars just keep missing each other. It's a load of old nonsense that the show would wrap up in 45 minutes these days, but is spread across four agonisingly dull episodes here. In keeping with this season's theme of revisiting elements from the show's past, this story sees the return of the mighty Brigadier Lethbridge-Stewart after a lengthy absence from the show. But the Brig is not the man he used to be. He’s shaved his ‘tache off for starters. As delightful as it is to see Nicholas Courtney again, the Brig's presence in this story really doesn't amount to much, or even make sense. Which isn't at all surprising when you learn that William Russell was originally meant to return as Ian Chesterson, hence why the story is set at a school, before he became unavailable and the script was hastily rewritten to feature the Brigadier instead. As I said earlier, ‘Mawdryn Undead’ marks the return of the Black Guardian. He's finally caught up with the Doctor and decided to... not actually do nothing. 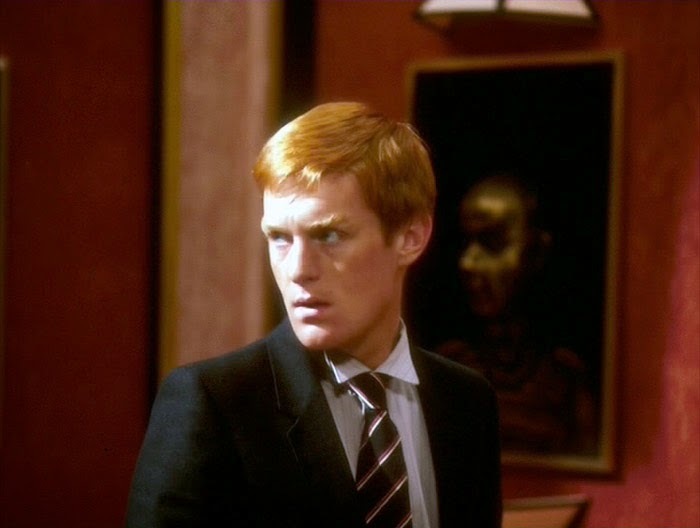 Instead he gets Mark Strickson's alien public school boy Turlough to kill the Doctor for him. Which just makes no sense. Why doesn’t he just hire a professional assassin instead of using this whinging ginger kid? Surely intergalactic hitmen can't be too expensive? Better yet, why doesn't he use those immense powers of his to blast the Doctor into oblivion? You can't set up a character as having god-like powers and then not have them use them for no real reason. And why is there a bird on his head? Did no one tell him that you lose all credibility as an intergalactic terror when you start wearing decorative poultry? The idea of an evil companion is definitely an attractive one, but the creative types manage to completely muck it up here. Turlough comes across more like a misguided cry-baby than a genuine agent of evil. And he is obviously a good ten years too old to be a plausible school boy. Still, Strickson proves himself to be a master of shiftiness. Shame he spends all his time whinging. --This episode is notable for creating the infamous UNIT dating controversy. Previously, the writers of the show intended for the UNIT stories to take place in the near future, rather than the time when the stories where made. This was confirmed in 'Pyramids of Mars', which aired in 1975, where Sarah Jane said she was from 1980. 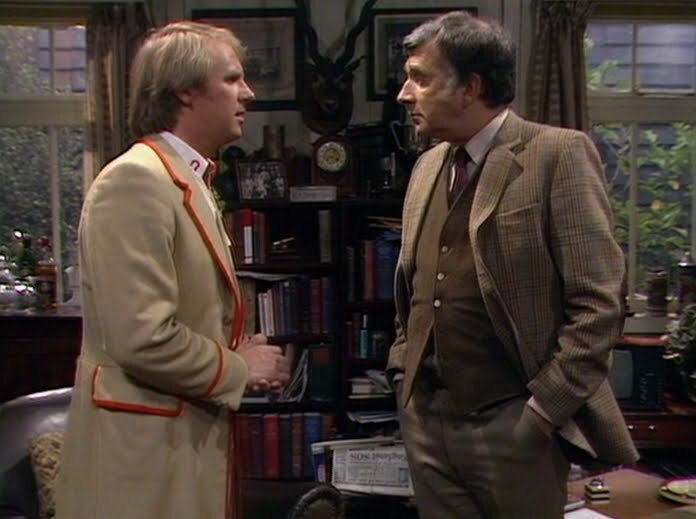 However, the Brigadier says in this story that he left UNIT in 1976, directly contradicting previous canon. --According to the Brigadier, Sgt. Benton left UNIT to become a used-car salesman, and Harry Sullivan is now doing secret governmental work. Probably developing the imbecile gas. --Mark Strickson is actually blond and was asked to dye his hair red so it would stand out from Peter Davison's blond hair. John Nathan-Turner initially asked Strickson to shave his head, which he wisely declined. --This story was a replacement for an earlier script, 'The Song of the Space Whale', by Pat Mills, which was later renamed 'The Song of Megaptera' and made into an audio drama for Big Finish's Lost Stories range. Tegan: "Maybe the capsule's malfunctioned. I hate those transmat things. Like travelling in a food mixer and just as dangerous. I'd be afraid of coming out puréed." Nyssa: "Regeneration? You don't mean it's happening again?" Mawdryn: "Life without end or form. Changing. Changing." The Brigadier: "Are we stuck on this ship?" The Doctor: "I wonder... if I reverse the polarity of the neutron flow..."
The Brigadier: "You girls will stay here." Tegan: "We girls are perfectly capable..."
The Brigadier: "You will remain here in the TARDIS. And that is an order, Miss Jovanka." Two out of four major continuity errors. Mark Greig is missing, presumed dead. More Mark Greig. it is the best thing I could come up with to describe whatever the hell it was the costume department were trying to do. I agree that the evil companion idea was promising but poorly realised. storyline was used now with Capaldi & co it could really reach its potential. UNIT dating was screwed up long before "Mawdryn Undead." Per the dating scheme established in "The Web of Fear" (40 years after 1935, or 1975) and "The Invasion" (4 years after "Web of Fear," or 1979), there's no way that the 1980 year given in "Pyramids of Mars" can be correct, given the year that apparently passes between "Terror of the Autons" and "The Mind of Evil" and the passage of time between May 1 and September 13 between "The Daemons" and "Day of the Daleks" and other implied time passages in the Pertwee years. If you accept the 1980 date given in "Pyramids" for Sarah Jane's native time, you have to move "Web" and "Invasion" back five years. If we've already established the precedent of moving the UNIT era back to benefit the placement of "Pyramids," there's no real compelling reason not to move "Pyramids" back to benefit "Mawdryn," save nostalgic affection for Hinchcliffe/Holmes. For most of the UNIT era, "20 Minutes into the Future" works just as well as 5-10 years into the future. In the 21st century, I'd suggest that the best approach to dating the UNIT stories is to use Sarah Jane's stated age in "Invasion (of the Dinosaurs) part one," which is 23 years old, and cross-reference that with her early-mid May birth in 1951 given in the Sarah Jane Adventures giving a range between May 1974 to May 1975 for the Dinosaur Invasion and calculating forward and backward from there.